Some things don't change. Take the 2010 Toyota Camry's buttery-soft ride and roomy, serene cabin, for example, which have been endearing Camry traits since we can remember. And some things get better with age. Look at the Camry's powerful, fuel-efficient and ultra-smooth 268-horsepower V6, which is not only the best Camry V6 ever, but also the best all-around V6 in any family sedan. Unfortunately, other things can sour with time. That's where the current Camry's underwhelming interior quality comes in. 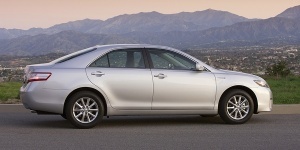 Overall, though, the 2010 Camry remains one of the top choices in this competitive segment. With excellent crash test scores and comfort and refinement to spare, the Camry's got what most family-sedan shoppers want.